China’s largest music streaming mammoth Tencent Music Entertainment Group (TME) started the ball rolling. Prior to submitting its prospectus to the US Securities and Exchanges Commission (SEC), the music streaming giant had reportedly downsized its US IPO repeatedly, first by 50%. And it went down by yet another 50%. Now, the company even postponed its investors roadshow and all the necessary plans in the run-up to its initial public offering possibly until November, according to the Wall Street Journal, citing people familiar with the matter. The delay for its upcoming public float was attributed mainly to the ongoing turmoil we are seeing in the global markets. The sad truth is: things seemed to be worsening. The famous BAT – Baidu, Alibaba, and Tencent – have each lost more than 20% of their value over the past year. Prices are plummeting with no signs of respite as the Sino-US trade war worsens. Apparently, 2018 was a booming year for Chinese tech giants such as Xiaomi, Pinduoduo, Meituan-Dianping who have safely made their way to the public markets. To be exact, Connecticut-based IPO advisor Renaissance Capital revealed that there were already 23 Chinese companies who have gone public in the US all within the first quarter of 2018. But, the ongoing global market uncertainty has started to see the slow down in the flurry of Chinese listings, with Tencent Music’s call to stall its plans being an example. Panicky investors looking to offload Chinese stocks amidst the market jitters have deterred Tencent Music’s debut dream. After all, this can very well affect the proceeds and public perception during times of intense scrutiny. Against this backdrop, let’s explore the financial performance of Tencent Music over recent years. Its filings posted consistent profits since 2016 and show no signs of slowing revenue growth. 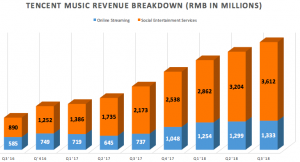 According to Seeking Alpha, growth for Tencent Music is faster and more massive as compared to Spotify. Its 800 million monthly active users (MAU) make light of Spotify’s close to 200 million MAU – and this massive user and revenue base wouldn’t make the US$30 billion valuation speculated by market watchers that unreasonable. Tencent Music is said to have a stunning growth story backed by strong fundamentals amidst the dark clouds hovering the global markets. However, it is important to highlight that unlike Spotify, Tencent Music is actually an all-in-one music app, offering more services than just music streaming. In fact, its major revenue driver is from its other social entertainment services and not music streaming. Contrary to the growing excitement that China’s age-old piracy problem in the distribution and supply of music is changing, Tencent’s recent prospectus revealed that its paying ratio for its online music streaming services was only at a mere 3.6%. This dismal result is coming at a time when we are seeing strong growth in the global music industry. With VCs pulling their money into the sector again and an 8% growth over the past year, the world’s music streaming revenue stands at $17.3 billion to date. Hence, it is clear that Tencent Music still has a long way to go to convert its music lovers into paying subscribers. And its ‘answer’ to the weakness lies in the heavy social networking aspect of its app. That becomes a source of major appeal for Chinese consumers and they are willing to pay for things like karaoke services, virtual gifting, social commerce, and live streaming all in one app. Effectively, this led to Tencent Music’s strong financial performance as opposed to the loss-making Spotify. Revenue growth is also showing no sign of stopping as yet. Given this unique business model, a more complete comparison for Tencent Music could be to benchmark Tencent Music’s performance with Spotify – for its music streaming – as well as with other live streaming players like Bilibili, Huya, and Momo etc. Head of Research at Aequitas Research Sumeet Singh told KrASIA that he believes that the present estimated US$30b valuation of Tencent Music is a little stretched. When looking at other live streaming platforms on an aggregate level, their EV/Sales (enterprise value-to-sales) ratio do not deviate much from that of Spotify. Those that fall below like the Nasdaq-listed YY and Momo were mainly due to weaker growth. Thus, unlike the bull market, it would be much harder for investors to profit if they are buying the shares at a high premium. Meanwhile, another potential stumbling block worth a mention will be the ‘steep prices’ that the firm has to fork out in order to control the master license in China – this in addition to paying for other licensing agreements with China’s Huayi Brothers, Ali Music Group, NetEase Music Group etc. Maybe this is why Tencent Music is in urgent need to raise funds from the public as the costs might just add up and more funds are needed. All in all, with Tencent Music’s major shareholder Tencent Holdings undergoing a major restructuring to pivot more into B2B as the latter share prices plummet over the past months; a volatile public market and potential competition, Tencent Music will have to tread carefully to continue its dominance and strong growth.